The concept of German decoupling from the Eurozone recession may have been wishful thinking. 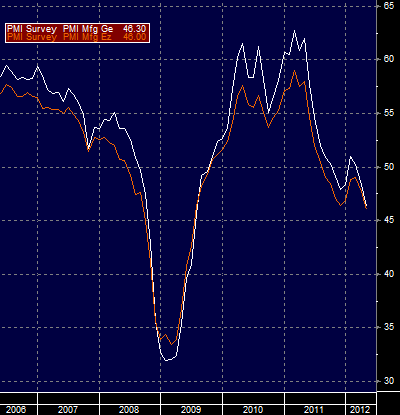 The latest German Manufacturing Purchasing Managers' Index (PMI) has converged with that of the Eurozone as a whole. Manufacturing PMI is a closely watched index and tends to be a leading indicator for the GDP. 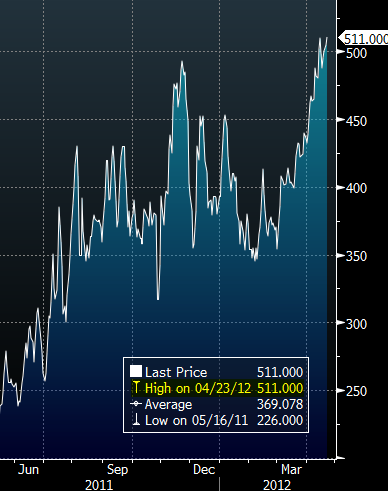 In response, Spain's 5yr sovereign CDS hit a new record high of 511bp (previous high was 510 on 4/16). The Eurozone is headed for a double dip.